Scientists: Please contact our office at (909) 866-5791 ext 210 to arrange your visit. General Visitors: Public tours/visits will resume in Spring. You can learn more about BBSO at our exhibit at the Big Bear Discovery Center. *) Take CA-30 N toward Mnt Resorts/Big Bear Lake. Immediately after you pass Fawnskin, turn right from CA-38/North Shore *Drive* onto North Shore *Lane* under the blue "BOAT RENTAL" sign. Drive east for about 0.2 mi, the observatory will be on your left. If you miss this turn, drive for about 0.9 mi and turn right onto North Shore Lane under the brown "SERRANO Camp" sign. Drive west for about 0.7 mi, the observatory will be on your right. Turn into the drive way (away from the lake) and use BBSO plan to locate your destination. You may park in either upper of lower parking lot. The front office is located in the Admin Building, entrance from the porch. 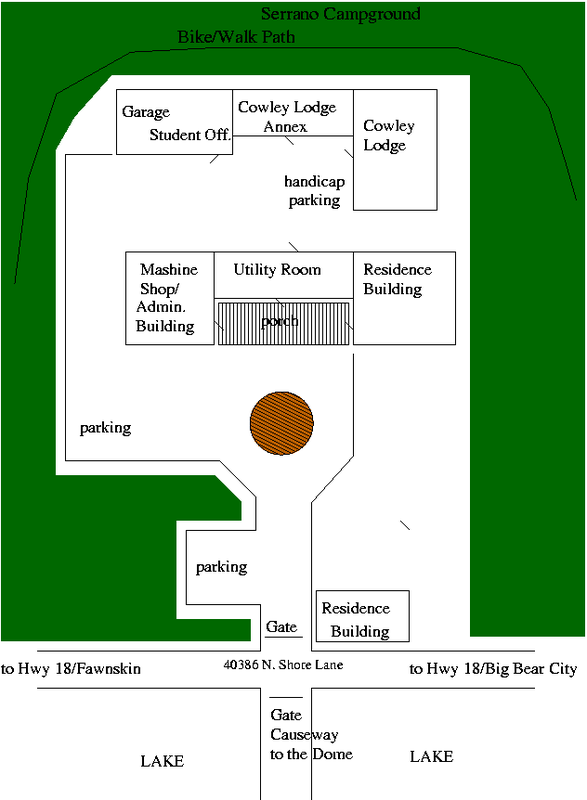 Offices are also located in the Cowley Lodge Annex. Accomodation at the Cowley Lodge. Single rooms in BBSO's Back Lodge are available at a rate of $20 per night for visiting scientists only. Lodging can be paid with cash or personal checks - credit cards are not accepted. There is no food service at the observatory. Accommodations have one common equipped kitchen. The nearest stores and restaurants are in the City of Big Bear Lake (~4ml). Wireless internet, washer and dryer are available. Renting a car is preferable. Nevertheless, to get around one can use Mountain Transit services provided by local transit authority. Ther is a bike that guests may use. There are many hotels in the area. For hotel accommodations we recommend the Best Western Chateau here in Big Bear Lake. Contact phone: (909)-866-6666, or Sherri Hoffman (sherri.hoffman at bestwestern.com), Sales Manager. Ask for *ask for Observatory discount*. Budget travelers may directly contact Stanik Nature's Inn for a low rate and quality accomodations. For more information on Big Bear Area visit Official site of Big Bear Chamber of Commerce or explore Google links to Big Bear. © BBSO/NJIT - Last modified: Aug 7, 2014.